Welcome to the Aug/Sept 2012 Edition of the HamSphere Newsletter. It has been a while since we arranged official contests on HamSphere. The logistics was usually the reason why we stopped doing contests. Too much paper work. But now we have a fully automated Contest Calendar so it will be a walk in the park in comparison. Once you have joined a contest, your LOG Book will automatically turn itself into "Contest Mode" on the day of the contest. This means that you will get an automated QSO Counter to assist you in the contest. The development of the iPhone and Android versions of HamSphere is going well. Both versions are in beta test state. You can apply now for an Android BETA-test password to download the hamsphere.apk file. We have currently 30 BETA testers testing the Android application. Email beta@hamsphere.com with your Android phone model to get the beta software for the Android Version. iPhone beta testing will commence in a few weeks. HamSphere handles many QSL cards per day over the built in QSL management system. We urge the operators to send one card per QSO only to minimize the load on the system. And most importantly, only send a card if you really have made the QSO. Over the past months we have seen an increased activity on the 40 meter DX band. This is good but it also generates some problems. It seems that many operators congregate around 7055 to hang around for some DX to arrive. This is all well as long as the number of operators on the frequency is low. But when in large numbers, chaos emerges. Please operate on frequencies that are in whole KHz (e.g. 7.070 Khz). This emiminates bleeding over and splattering. DX Pile ups can normally be mastered by skilled and experienced Ham Radio operators who are used to handle a big load of traffic as a DX-station. But with our HS Radio Enthusiasts who still are in the learning process of the Ham Radio protocol, it usually fails. Another problem with the ignored Ham Radio traffic protocol is that operators often just burst in on 7055 shouting their callsign without checking the frequency and what's going on. 1. Spread out. 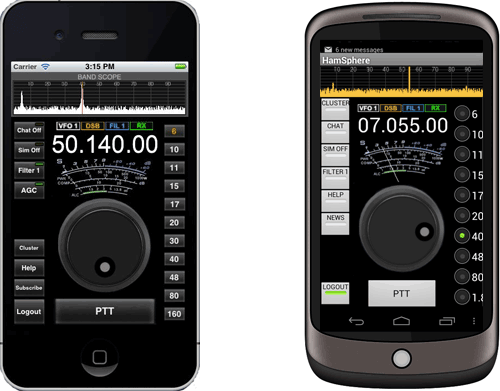 Call CQ on other frequencies than 7.055. Your callsign will be acknowledged in the cluster and your Band Scope "spike" will be seen. 2. If you have any experience from "pile up" DX traffic, please step in as Channel Master/Controller. Often this is a good way of controlling and distributing a rare DX to group of operators without creating chaos. 3. Study the Ham Radio Protocol. 2-Way radio requires a rigid protocol (method) in order to make the conversations and contacts smooth without doubling or chaos. By using our Support Ticket System you can file a support message/question and you will have a reply within 24 hours. Cod-gers net will be next on air 9/3/2012, 19:00 UTC 20m 14.290. We will also issue a qsl card to all participants that evening. Welcome! For the first time HamSphere puts up an SSTV contest. SSTV contests are rare on Shortwave and mostly conducted by Japan. The contest will be held from Sept 14th 2012 (16:00 UTC) to Sept 16th (21:00 UTC) A station may only be worked once each UTC day. Read more about this contest. We have received some questions about the HamSphere transmitter and the power emission. Each HamSphere Transceiver has a Local Oscillator, a Balanced modulator and a Power Amplifier which generates the signal. The power is injected into the "Sphere" with a logarithmic scheme. The transceiver power setting is between 0-11. Here is a power Setting - Watt translation table. This means that the signal propagation is very realistic and comparable with a real shortwave transmitter. Hence using setting 11 constantly will make your signal splatter. Use the power setting with common sense. Steve Miller is running the DX Power Hour Of Music only found on HamSphere 48 meter Band.. In July 2012 we moved from the old server platform to a newer more stable server. The move went smooth thanks to all preparations. Currently we have five servers in the network. Four servers are serving the Desktop Applications and one server is serving the mobile platforms. The “Tell a Friend” page has been successful. If you enjoy HamSphere, you can send invitations to your friends and also get rewarded if your friends join HamSphere. How does it work? In your invitation message there is a tracking link so that the system knows when your friend creates an account with HamSphere. If he/she will do so you will be credited extra subscription days. Bruce 43HS031 has an excellent CW guide here http://43hs031.hamsphere.net/. CW is fun and exciting. HamSphere has 3 bands for CW use, 160, 80 and 30 meters. There is also a CW contest 27 Oct 2012. See the contest calendar. We have now received over 5600 Likes on FaceBook – Thank you FB users. And thank you to over 2000 followers on Twitter. Super!